No. 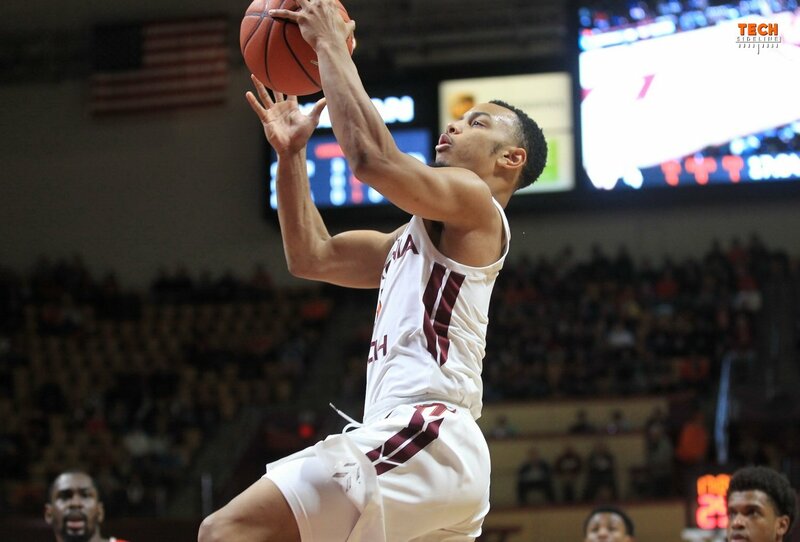 14 Virginia Tech defeated VMI 89-68 in Cassell Coliseum on Wednesday night to move to 7-1 on the season. The Keydets dropped to 5-5 on the season. The Hokies generally played well, and in fact led by 37 points (67-30) with 11:44 remaining in the game. However, after committing just two turnovers in the first half, they got sloppy with the ball in the final 10 minutes of the game, and VMI was able to make the game more respectable. Tech finished with 11 turnovers for the game, though most came well after the outcome was decided. Nevertheless, Tech won the game by a big margin of 21 points. The Hokies placed four players in double figures. Justin Robinson had 18 points and five assists, while Nickeil Alexander-Walker had 15 points. PJ Horne had 12 points and was a perfect 6-of-6 from the field, to go along with five rebounds, two assists, a block and a steal. Freshman Isaiah Wilkins came off the bench to finish with 13 points. Williams is pleased with the development of Wilkins. Ty Outlaw was Tech’s top rebounder with 11 boards. He was just one point away from a double-double, finishing with nine points. Virginia Tech was 30-of-58 (51.7%) from the field and 11-of-25 (44%) from three-point range. They had 19 assists on 30 made baskets, they outrebounded VMI 35-29, and they forced 15 Keydet turnovers. The Hokies have just four games remaining before conference play begins on January 1 against Notre Dame. The Hokies will return to action this Sunday, December 9, when they host South Carolina State. Tipoff is scheduled for 1pm, and the game can be seen online on ACC Network Extra. The Hokies entered the game ranked 15th in the AP poll and 14th in the USA Today Coaches poll. Justin Robinson scored a team-high 18 points. He has recorded double figures in seven of the eight games this season. Nickeil Alexander-Walker scored 15 points. He has scored in double figures in all eight games this season. P.J. Horne scored 12 points. It is a season high for him and the first time this season he has scored in double figures. Isaiah Wilkins scored 12 points. The second time this season he has scored in double figures. Ty Outlaw grabbed a career-high 11 rebounds and missed his first career double-double by just one point. Always glad for a win, but I feel we take advantage of VMI sometimes. I wish VMI could get on par with UVA, where we could play in football as well. I think with the military connection, it would be a great rivalry and much more civil LOL. Isaiah Wilkins is the brightest rookie surprise in a very long time. It is obvious that his game is growing with every appearance. He is going to be tough to handle when his body and confidence become rock solid. I see him becoming a rebounding force from the guard spot. If you watch Blackshear around the point in the game when it was 30-16 or so, there is a stretch where he is slow to get downcourt, listless and not playing with injury. He needs to get over being pulled after his first foul; he has a tendency to get 2 ones and if he wants to stay on the court, he needs to avoid the silly fouls when he gets tangled with someone. Body control is often what he is missing and it starts with his mobility. But mainly speaking to his seeming mindset when watching. Could be wrong but there was a trip in which nearly everyone ran past him as he “jogged” downcourt. Blackshear was real upset about the second foul in the first half and gave the ref some lip. he was a hairsbreath away from a T. The ref chased him down and Justin got in between to settle everyone down. Not a good moment for KJ.